Whether it’s a regular Tuesday evening or you’re heading out to a dinner party, this question is very important: should you go for red or white wine? Certified personal trainer Maria Brilaki (known as @fitnessreloaded on Instagram) posted this comparison to answer your burning question. As you can see, five ounces of Pinot Noir compared to Chardonnay is about the same number of calories and the same number of carbs – it’s basically a tie. If wine is one of your favorite indulgences, go for it! Celebrating with one drink at a holiday dinner or family get together is good for your soul and your health (thank you, antioxidants!). Wine also contains compounds that may be helpful for the heart (resveratrol), and drinking wine can help you relax and control stress (which you could use this time of year!). While drinking too much wine can cause weight gain, too much alcohol isn’t good for your health either. 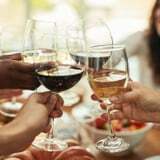 The United States Dietary Guidelines 2015 to 2020 recommend “up to one drink per day for women, and up to two drinks per day for men.” So go ahead, and enjoy that one glass of wine – red or white – but remember to drink responsibly!